St. Mary's replaced an earlier church, a little distance away, which was consecrated on 31 July 1838. Unfortunately, the earlier church collapsed because of subsidence, and it was closed in 1869. The foundation stone of St. Mary's was laid on 15 August 1871; and the church was consecrated on 10 September 1872. The new parish of Brymbo was created on 6 December 1844. It contained the township of Brymbo and part of the township of Broughton, both of which had previously been in the parish of Wrexham. On 5 March 1880, the western part of the parish went to the new parish of Bwlchgwyn; on 15 February 1909, part went to the new parish of Broughton; and on 7 May 1921, part went to the new parish of Southsea. 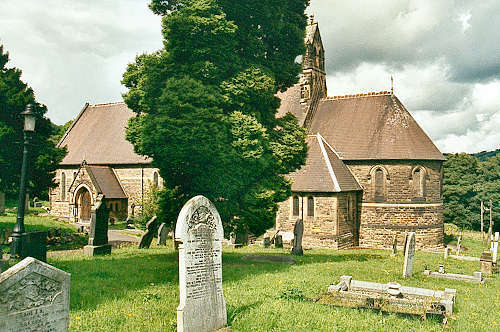 For family history information about the church and parish, visit the GENUKI Brymbo page.